Last week I had an email exchange with a tech of one of the current 3340 manufacturers. In general the 3340 is very picky regarding the PSU and even he has not been sure about the actual minimum voltage supply needed. Thomas Henry designed this circuit for 15V, when oyou build it according to his documentation you will have no issues at all. 1. Use a nice and reliable PSU with enough juice. 2. Don't resistors in line at the power entry of the module. 3. Don't use the TL431 to further down-regulate the power. I will update the documentation accordingly ASAP. I did some investigations about this problem. Please read my posts at Muff so at least you will know what I tried to test. As a short summary I will mention that I tried every possible idea I had without much success. "To every problem, there's a solution that's simple, obvious and wrong." I am astonished about this result. Last week I tried a NOS CEM3340 on 12V w/o recognizable change in pitch with PWM, and I did not even touch the load resistor on pin 4. But I will check again. And with 15V? This is new to me. I am very surprised by this. I've built 6 copies of this design so far with Fonik's pcb, using both revG and 1982 date code CEM3340's. I do all of my stuff with +/-15V, use PowerOne power supplies, and my format is 5U (eurorack is too small for my eyes and fingers!). I have high confidance in my PSU's, so I did not use the TL431 regulation. These modules are STABLE. I have not had any tuning issues, and I make heavy use of both the PWM control and the PWM cv input, often varying the PWM cv past its range. No tuning problems here. Thank you. This is what I discovered so far. It is dependend on the supply voltage. The lower, the worse. I guess it has something to do with the internal Zener? Has the current limiting resistor for the zener been adjusted for the lower voltage? I was poking around the data sheet and some ideas last week, and it seemed to me that it ought to be dropped to 560R from 820R. I have to mention that my built worked perfectly from the beginning. All waveforms are correct, the sub output and switches do what they are supposed to do, it is frequency stable and 1V/oct on several octaves, FM and SYNC inputs also work great when I modulate them from another VCO. I was sure everything was working right but a few days later when I started to manually rotate the PW knob I discovered that it affects the pitch. The VCO is frequency stable at any static PW position. Today I had some more ideas and tested them. Posted them in the VCO MAXIMUS thread at Muff. Should I post my finding here or is it OK for you to read there? A link to the Muff's thread would be helpful, but I don't see any reason you'd need to post the same things both places. I have to mention that there are a few other projects based on 3340 and many members mention this PW to tune error so it is not just a VCO Maximus specific problem. I'm more and more convinced it is an implementation problem. 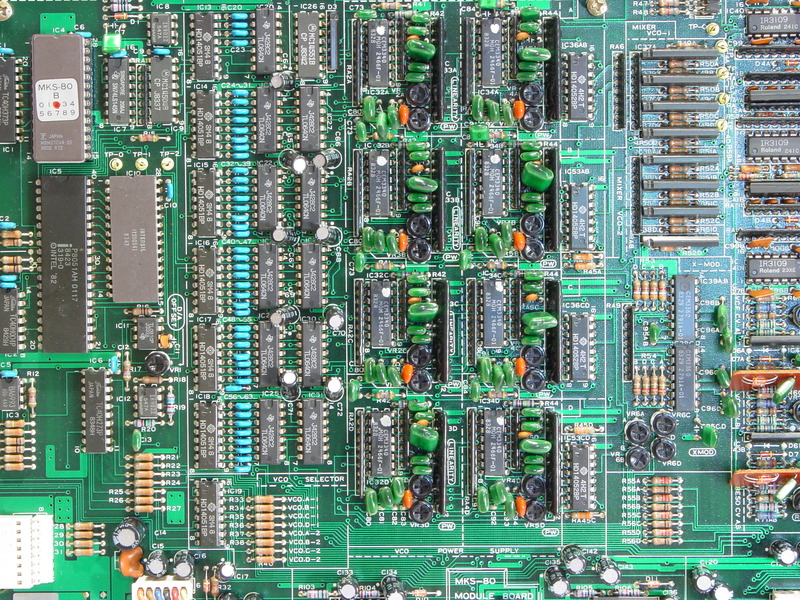 After reading all the complains I thought to check PCB photos and service manuals of various 3340 implementations and what I find surprising is that roland Jupiter6 and MKS80 have some very interesting solutions. They developed some custom resistor networks and installed them very close to the VCO chips, also decoupling caps close to the pins and a sophisticated ground scheme. Also interesting is that in Jupiter6 and MKS80 the 3340 chips are powered at +10V and -5V which makes all the discussions about +/-12V or +/-15V pointless. Is this where you were seeing those other implementaitons? If not, there's some useful info there. the +12/-5 is due to the supply limits of the chip. It basically bypasses use of the zener, which limits the - supply to 6.5V internal to the chip. I checked the Electricdruid page at an early stage of building my VCO Maximus. No, I was talking about checking how manufacturers implemented circuits with 3340 chip at a phisical level, on real PCB not only schematic. As I mentioned they used a pair of resistor networks custom made for each 3340 chip. All connection very short. Check also the service manual to see the PCB traces. On Muff there are several eurorack module projects based on 3340 chip like Kassutronics VCO3340, Timo Rozendal CEM3340, Nonlinearcircuits NLC 3340 VCO, OPENCEM3340, etc. Reading the specific threads gives you the idea that the problem I mentioned is not something specific only to VCO Maximus. I think this is an implementation problem. It looked like you'd done the OG CEM3340 and one other; I'm curious if a detailed comparison across CEM/Rev G/AS/CoolAudio has been done. Yesterday one of the team powered his MAXIMUS from 11V using a bench supply w/o any trift (beads ISO 10R on the modules power entry point). Now it is getting weird. It looks like I found the solution. After checking every possible thing and having no idea what to do to move the things in the right direction I started to find something common in most service manuals. One thing started to look similar was the fact that contrary to what is suggested in the data sheet Memorymoog, Jupiter6, MKS80, Prophet5, SH101 all have -5V at pin3. "WIDTH - computune data for each vco ideally approximately 5V. It may vary with the characteristics of the VCO IC. If the value greatly differs from the ideal value, the corresponding VCO is judged to be defective, unless the computune operation is improper "
This made me think what if I would go in the opposite direction suggested by Alfa and others to reduce R4 for +/-12V operation. I started to increase the value and also measured the voltage at pin3 and the PWM to tune error. First I tried 910 ohm, voltage went lower and error was a bit lower. Then step by step I tested 1.2k, 1.5K and finally 1.6K. With R4=1.6K the voltage at pin3 was 5.05V and the PWMto tune problem was gone at 1000Hz. So as a conclusion the goal is to have on pin3 as close as possible to -5V and the PWM to tune error will not manifest itself. You should check what R4 value is optimum for your build depending it is +/-12V or 15V and your specific 3340 chip. You should not go lower than -5V. P.S. Later as a curiosity I checked the Juergen Haible HJ2VCO dual CEM3340 VCO. Juergen divided the negative voltage with a resistor pair to -5V and buffered it with a non inverting opamp to pin3 this way also creating a local low impedance voltage source. I think this is the right way to do it. Also please do not forget to change R19 to 51K if you use AS3340. Original CEM3340 works with 10K. I also increase R35 to lower the load of PULSE/SUB circuit on pin4. Ah, now this makes sense! I will check this with my build later this week. Thank you very much for your efforts and for sharing! It was a real pain but I'm glad I finally managed to solve this puzzle. - need to power the module without 10 ohm resistors. Current variations induced by the logic chips produce voltage variations and it reflects on tuning. Install jumpers or inductors instead of 10 ohm resistors. - change R4 to a value that will give you -5V at pin3 of 3340. Do not go below -5V. - decouple pin5 of 3340 with a 1nF capacitor directly between pin5 and pin12 (GND) below the PCB. - in case you install AS3340, use R19=51k as a load for pin4 (pulse out). Original CEM3340 works with R19=10k. - I suggest to narrow the voltage range at pin5 to limit the pulse width from approximately 2% to 98%. - you reduce the risk to expose pin5 to voltages above or below the suggested limits (0-5V). Also change R53 to 91Kohm, this will limit the upper range or the pulse width. Rotating now the PW knob from CCW to full CW will give you a nice pulse wave with varying pulse width from approximately 2% to 98%. I forgot to mention I discovered a small error in the schematic from the build document. PW INIT potentiometer (R50) in the schematic is connected to GND and +12V. It should be connected to GND and -12V. Did you use the ALFA A3340? I installed a trimmer and with the A3340 I ended up with something more 1k5, whereas for a NOS CEM3340 I trimmed about 1k2 (using my nice and clean linear 12V rail for the 3340). Anyways, thank you so much for sharing. With your consent I will incorporate your findings into the documentation later this week. Yes, I used the AS3340. I'm glad you confirm you used a similar resistor value to what I used. You're welcome. Yes, please add my findings to the document. I recently built the maximus and I'm confused about the (strong) sync input. It works differently from my other oscillators, and I'm not sure if it is working correctly. Can anyone say exactly how it is supposed to work, for example what sort of voltage in what direction at what speed should cause the oscillator to reset? I like to sync to gate so the oscillator resets on each new note, but the Maximus doesn't do what I expect when I do this, it seems to need a negative trigger to reset is that correct? I worked through that list and did everything, and it certainly changed things, but it didn't fix it. I have noticed that the board overlay values and the schematic values in the build document I have do not match - the schem has values that reflect this discussion but the board diagram has older values. Since I originally populated the board based on the board diagram then I may have missed some other change.